We Bought A Zoo Is An Inspirational Film For the Whole Family. The heartfelt drama We Bought A Zoo comes to town and it's for the whole family. A true story perfect for the holiday season with an uplifting account that shows what one family can do to help a community while healing themselves. I am a fan of this kind of film as it reminds us of the principles on which America is built, with dreams, hard work and service to humanity. The recently widowed Benjamin Mee (Matt Damon) has had a hard time with the loss of his wife and raising his two children young Rosie (Maggie Elizabeth Jones) and teen Dylan (Colin Ford). So much so that with Dylan's school problems, no time for Rose and a dead end job, Ben decides to quit and move out of his city far enough away to get control of their lives. After looking at unsuitable homes for his children the realtor takes a chance on showing him a house with a lot of property attached. When Ben's daughter Rosie says she feels that this is the one, the realtor presents them with a problem. If Ben purchases the house he has to take a zoo complete with 200 animals. The actors are perfect for their roles as you can see it in the way they seem to have fun portraying the characters. The Mee family proves exciting with cutesy Jones as an eager Rosie who loves animals; Ford realistically playing an upset Dylan who has to leave his friends behind; and Damon as Ben an earnest decision maker who takes a chance on a challenging future. In support Scarlett Johansson plays the no-nonsense Kelly Foster, manager of the failing zoo. She shows her steadfast side while trying to understand why the mild mannered Ben would take on the huge task. Her pivotal performance makes the story work bringing sense to the family while trying to hold on to her job. Elle Fanning becomes the ace in the deck being the one who brings Dylan out of his stubbornness and back into the family. 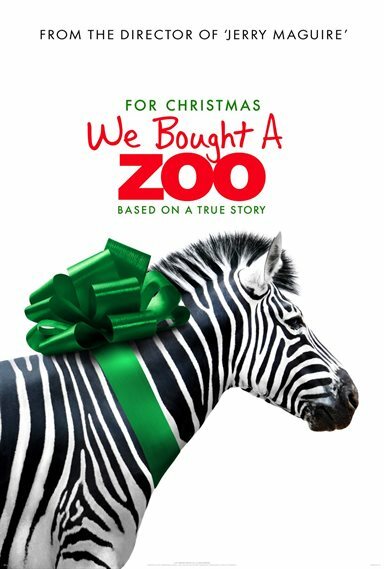 We Bought a Zoo provides a touching story that should hopefully resonate within the families of America showing what one family can do to help themselves and others in need. "All you need is 20 seconds of insane courage and I promise you something great will come of it. "- Benjamin Mee. Whether it's the reopening of an attraction that helps support the community, patching up relations or providing much needed work for people, the film should win the hearts of all who see it. The movie has been rated PG by the MPAA for language and some thematic elements. Download We Bought A Zoo from the iTunes Store in Digial HD. For more information about We Bought A Zoo visit the FlickDirect Movie Database.